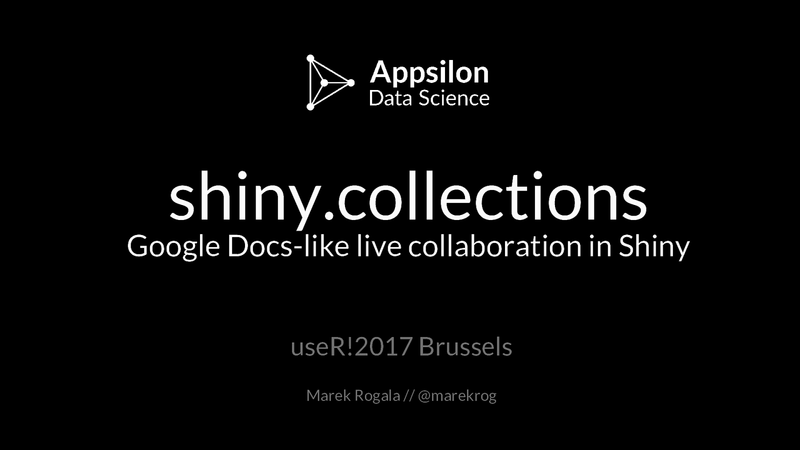 View Shiny.collections: Google Docs-like live collaboration in Shiny on Notist. What users expect from web applications today differs dramatically from what was available 5 years ago. They are used to interactivity, data persistence, and what’s more, the ability to share live collaboration experiences, like in Google Docs. If one user changes the data, other users want to see the changes immediately on their screens. They don’t care whether it is a data-exploration app from a data scientist or a solution built by a team of software engineers. Shiny is perfect for building interactive data-driven applications suited for the modern user. In this presentation, we show how to create real-time collaboration experience in Shiny apps. From the presentation, you will learn the concepts of reactive databases, how to use them in Shiny, and how to adapt existing components to provide live collaboration. We will present a package we developed for that. shiny.collections adds persistent reactive collections that can be effortlessly integrated with components like Shiny inputs, DT data table or rhandsontable. The package makes it easy to build collaborative Shiny applications with persistent data. The presentation will be very actionable. Our goal is for everyone in the audience to be able to add persistence and collaboration to their apps in less than 10 minutes. Marek puts presentations on for free. You can too.